Believe it or not, you can improve your child’s health and fitness, test scores, and social/emotional competence with one simple daily event. Numerous studies all tell us that the family that eats together is the healthiest and maybe even the smartest! According to a Harvard study (2000), children in families who eat dinner together “every day” or “almost every day” get more calcium, iron, B, C and E vitamins, and consume less saturated fats. They also consume less soda. A University of Minnesota study (2004) reports that family meals correlate with healthy weight control and less substance abuse in children. A second University of Minnesota study found that children in households with family meals eat more fruits and vegetables and fewer snacks. A 1994 Lou Harris-Reader’s Digest Poll noted correlations between family meals and higher test scores. Educators have long noted family meals as a positive factor in reading comprehension. For better or for worse, food is a significant part of family life. It really does fall squarely on the shoulders of the adults to make sensible choices that influence a lifetime of eating habits. Offer healthy foods at every meal. We all know that children may not eat those healthy fruits and vegetables every day. But over time, if presented with a balanced diet, even toddlers will make the right choices to eat the right foods. Try putting small portions on your child’s plate, let your child eat what he likes, and set a good example yourself. You’ll be surprised at how well mealtimes can go when power struggles are eliminated. Focus on mealtimes as together time instead of on quantities of food consumed. World renowned pediatrician, T. Berry Brazelton, says eating problems often occur because parents care too much rather than not enough. Encourage children to listen to their bodies to decide how hungry they are. Get children involved in meals, from preparation to clean-up. You can use the help and your children want to be contributing members of the family. All children can help prepare simple healthy foods (from tearing lettuce for salads and washing fruit to chopping vegetables and flipping pancakes). All children can help set and clear the table (its math skills for preschoolers and a good time to hear about school-age peer dramas). Say “NO” to multi-tasking and technology during mealtimes. Turn off the phones, the computers, and the televisions. As mentioned earlier, mealtime is family time. Children want to know their parents are available to them. Ellen Galinsky’s Ask the Children research tells us that more and more children are seeing their parents as rushed and stressed-out. 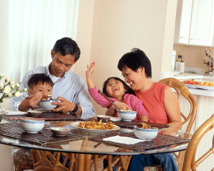 Family mealtimes provide a daily opportunity to reconnect with one another. Create your own mealtime tradition that gives your family a sanctuary in a busy, demanding world. Grace and blessings weave spirituality into daily life, teaching important values. Find rituals that are meaningful to you. One family makes it daily practice to start dinner with each person saying one positive thing about each person at the day. There are days when that ritual gives mom or dad as much of a boost as it does the children. So, what are the obstacles? It all sounds so easy. Time, stress, over-scheduling, picky eaters, exhaustion, work, and, did I say, time. Meals with children are really only 20 to 30 minutes long, not 5 courses at La Veilles Maison. And there are thousands of cookbooks and websites with 30 minute meal preparations. The real problem is change. We’ve gotten ourselves into must-do schedules. We’ve lost the habit of cooking and eating in. Could it be that cooking has become another chore like cleaning the toilet? It represents drudgery not intimacy. If someone else can do it better, why not let them? Our world offers us as adults many comforts. The problem is that not all of those conveniences are good for children. If you are not ready to become that 1950’s cook-and-freeze mom, I understand. Try baby steps. Buy healthy food. Avoid fast food. Ask dad to cook too. By all means, sit with your children every day. Their brains and bodies are counting on it.